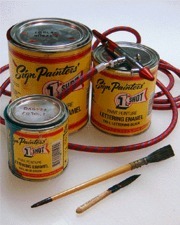 in lettering enamels for over 50 years. Excellent flow characteristics, single stroke coverage and vibrant durability are just a few of the reasons 1 Shot Lettering Enamels remain the favorite of pinstripers and sign painters alike. With their infinite color blendabilty and a full line of reducers and hardeners, it's no wonder 1 Shot Lettering Enamels are used by more sign and graphics professionals, than any other brand. SAFETY: 1 Shot products are intended for professional use. It is not intended to be used in or around residential households. See Warning and Caution statements on label. For health and safety considerations, consult the current Material Safety Data Sheet for this product. Note: Some colors are not available in all sizes.